Our school and department focuses pretty heavily on analyzing documents using DBQs. We spend time teaching our students to annotate and take notes on sources using a variety of analysis strategies. This year I decided keep the strategies but change the tool, instead of working on paper with pencils and highlighters, students annotated a map of the Byzantine Empire using Google Drawings. Here are a few takeaways from this experience and things to consider when you try it in your class. It is important to be purposeful when incorporating new technology into the classroom. 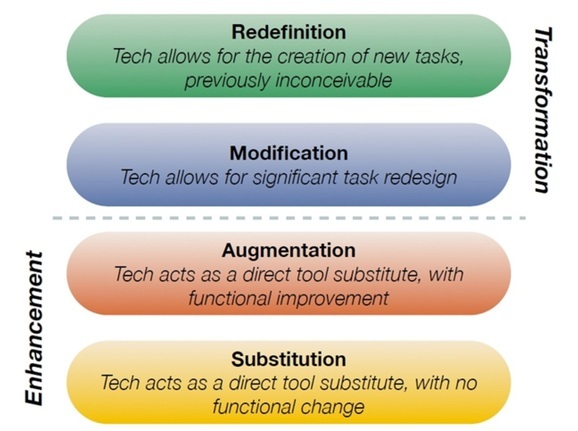 Using the SAMR model, shown above, is one way to ensure the technology being used is beneficial. In this case, using Google Drawings to annotate historical sources transforms the task. The technology modifies work by allowing students to bring in outside sources to enhance their annotations. Students can paste in additional maps to compare to theirs. Students can add images to contrast historical photos. Students can search and add in quotes that connect to written documents. This allows students to think deeper by pulling in additional resources and to analyze in a way that redesigns the task. Using Google Drawings allows for a student to keep their work clean and organized. Google Drawings has easy to use formatting tools that give the students complete control over their work. Student can zoom in and out to get arrows in just the right spot. Text boxes can be moved or colored to make their ideas easy to read. Words can be highlighted in different colors to help ideas stand out. Mistakes are easily fixed without messy eraser marks like when using paper and pencil. One of the biggest benefits of Google Apps in general is its share-ability. Students can easily collaborate using Google Drawings by sharing the document with one another. In addition, the work can be shared with the teacher. This allows you to give immediate feedback, in real time, using comments or to access a students work from anywhere there is an Internet connection. This means you no longer have to lug home 87 student papers! I asked many students for feedback on how they felt using Google Drawings to annotate and an overwhelming majority preferred it to annotating using paper and pencil. The one draw back stated by several students was the amount of time. Many agreed that using Google Drawings took more time than annotating by hand. Although I think that the benefits make the extra time worthwhile, this is something to consider when using this tool. Watch here for my tutorial video on using Google Drawings to annotate historical documents. I saw your screencast. Did you know screencasting is built into the WeVideo video creation ecosystem? Give us a test. See what you think. Thanks. Thanks Greg for the info. I will check out WeVideo.